WebShree offers SEO Packages for clients. This refers to use a number of social media outlets and communities to generate publicity to increase the awareness of a product, brand or event. Types of social media include RSS feeds, social news and bookmarking sites as well as social networking sites like video, twitter and blogging sites. Seo provides visibility of site in Search Engine Result Pages. SMO is similar to search engine optimization in that goal is to generate traffic and awareness for a website. In general social media optimization refers to optimizing a website and its content in terms of sharing across social media and networking sites. Businesses and Individuals in Delhi can avail our SEO Services. Our SEO Services in Delhi offers affordable Best SEO Packages Delhi plans that customized on page optimization and off page optimization techniques and make your website complete the local search market. Online Marketing is one of the best ways to market your product or services rapidly. 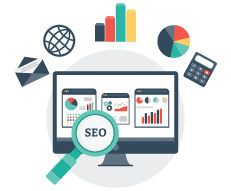 WebShree, SEO Service provider in Delhi offers Quality based SEO Services in Delhi that would prove to be a productive way of marketing your product or services. There is some basic plan which involves SEO Packages Delhi. Client will provide all the contents for site, articles, blog comments, video clips, audio etc. and can be provided by us at request. Request a quote for Website Maintenance Packages on SEO point of view as well as Online Marketing Services. Our SEO approach has time to expose the many opportunities in the most competitive segments. We worked for local campaigns as well as global campaigns that run into many no. of keywords. We mostly use White Hat SEO in our SEO strategy there is very minimum chances to penalized site. It is a pure and algorithmic based stepwise process. Our SEO services are fully organic and responsive. And these are especially customized for project, rest are about the best returns. Rankings take time but there is no reason why you should wait forever to see results.